But before we meet her, director Alex Garland introduces us to Caleb (Domnall Gleeson). Think of him as Everyman of the Computer Age. We meet him in a cubicle, working on a computer as a software engineer in the world’s largest internet company. His isn’t the most exciting life in the world, but as we meet him, he gets exciting news: he’s won the company lottery and first prize is a week with the company’s reclusive head, founder and resident genius, Nathan (Oscar Isaac), in his remote fastness in Norway. Before he/we know it, he’s whisked away by helicopter and introduced to Nathan, who explains why he’s here. It’s simple: Nathan has invented artificial intelligence and Caleb is to be its Turing test. Named after Alan Turing (of The Imitation Game) the test is designed to determine if a computer is intelligent. From the start Nathan goes out of his way to tickle Caleb’s ego. It seems he wasn’t randomly selected after all. Nathan: Come on, Caleb. You don’t think I don’t know what it’s like to be smart? Smarter than everyone else. Jockeying for position. You got the light on you, man. Not lucky. Chosen. 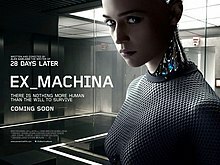 It’s tempting to see this fable as a fulfillment of Stephen Hawking’s prophecy to the BBC in December of 2014: “The development of full artificial intelligence could spell the end of the human race.” He fears the Terminator series run amok. If machines become smarter and more powerful than us, we’re doomed to lose Darwin’s survival of the fittest game. But seeing Garland’s film in that light, I think, would be foolish and self-serving, for as he made clear in an NPR interview in April of 2015 the problem he’s warning us of isn’t Ava, it’s us: “The tension in this film is much more directed at the humans.